Bite-Sized: Cultist | Wake up, Meeples! A Junking attack is one of the most powerful effects in the game, and doing it non-terminally is extremely powerful, as it allows you to get a lot of copies of the junker to pile the junk on quickly and swamp the opponent. Drawing cards is also a very powerful effect, particularly when you can do so non-terminally. Cultist is terminal, but because extra copies of it effectively are not, it gets most of these advantages, provided that you stick to getting more Cultists. A typical Cultist game involves getting some good treasures, then as many Cultists as possible until the ruins run out, and then taking stock. Many times, at this point, you simply get Province on 8, Gold on 6, or another cultist on 5 (until Duchy becomes the better option), or silver on less, and playing more or less a money deck. If there is particularly strong trashing, though, it’s often (though not always!) worth pursuing that and building up to bigger and better turns, as all the junking often makes the game last pretty long. In any case, the big, slightly unusual thing to watch out for is pile outs – Ruins are going to run out, and Cultists themselves often run out (or get close), which means that any third pile (say, Duchy) can be the end of the game. 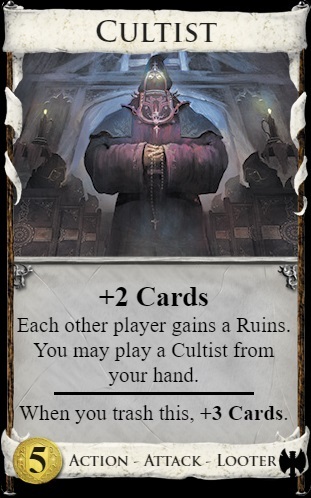 The other thing to note is that the on-trash effect is nice, usually with some kind of trash-for-benefit card, but it’s not a main part of the card’s power, and even without a way to use it, Cultist is quite powerful.